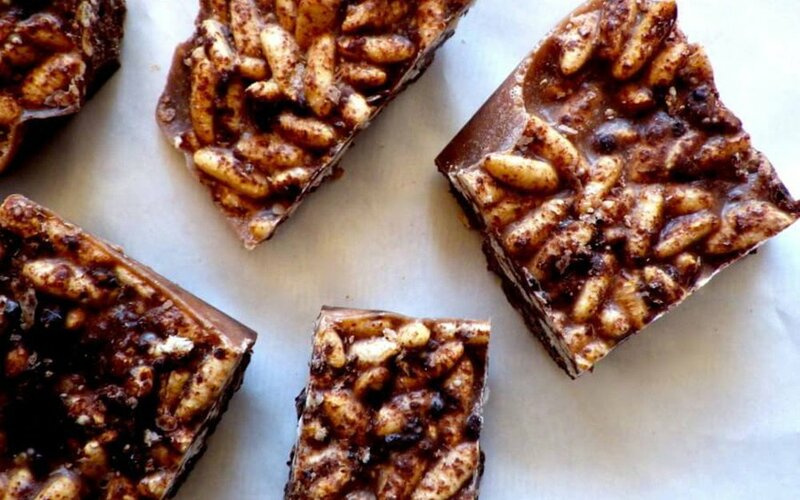 This is the perfect little piece of dessert one needs when craving something sweet and crunchy. The perfect bite to grab out of the freezer whenever the craving strikes. Ready in just a few minutes and full of only wholesome ingredients. Make a batch (or three! 😛) and store in your freezer for when the craving strikes. Combine all ingredients, except the coconut oil and rice crisps, together in a large bowl. Slightly heat coconut oil to melt and pour over ingredient. Immediately stir everything together very well, until smooth. Now carefully stir in brown rice crisps and pour the mixture onto the parchment paper. Use a spatula to spread out evenly. Place in the freezer for at least 30 minutes. Cut into squares and store in the freezer for up to a month! PS - Add chopped nuts, goji berries, coconut flakes or any other creative additions you think would go well. If you try this recipe and enjoy it don't forget to share and leave a comment!